Diaphragm jig separator is a kind of popular gravity separation equipment, it can work great independently or work together with a shaking table. With the research and development of the jigging machine, the jig gravity separator has been very common and mode popular in these years. JXSC mining machinery factory is a professional manufacturer of mining beneficiation equipment, has many clients with its rich chrome upgrading experience. We can do trial test for you if samples can be available. Saw-tooth Wave Jigger is capable of dealing with almost full sizes of mineral materials and very fine material. They can achieve a good result in processing such as placer gold, tantalum-niobium, titanium, tungsten, iron, tin, hematite, cope, manganese, barite, zirconium and chrome, etc. 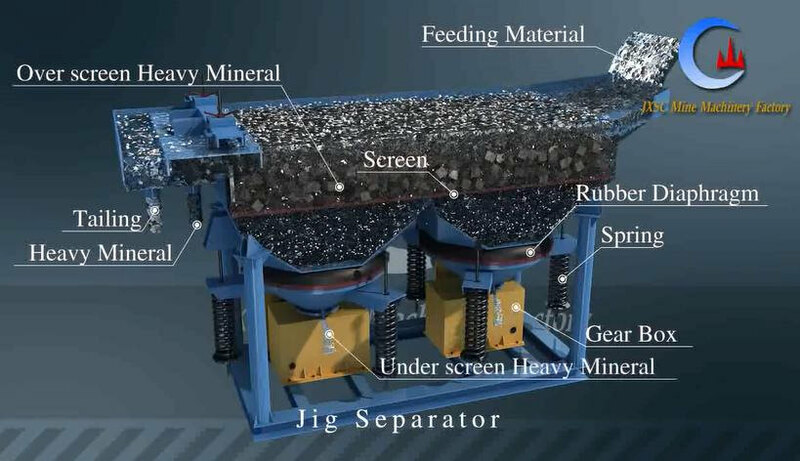 More and more prospectors prefer to use the Jigger Machine in Coal Mining, so It also plays a very important role in coal separation. Jig machine is widely used in processing plant of tungsten, tin, gold, columbite, titanium, iron, coltan, manganese, diamond, chrome. It can also be used for recovery for alloy particles from manganese slag, chromites slag and stainless slag, etc. To recover Finished Concentrate from ores in which the mineral grains are liberated. Recovery of minerals of various kinds that occur in Placer / Alluvial deposits, or decomposed rocks. Recovery of minerals from primary/ hard rock ore, which can be liberated by the crushing/ grinding process, i.e. (Diamonds, Color Gemstones, Barite, Gold, other precious metals, base metals, ferrous metals, light metals, coal) and heavy minerals of all kind. Cobbling operation, to discard waste rock before final processing of the crude concentrate. JT series jigger is a kind of new-type diaphragm jigger for ore beneficiation which is widely used in the ore beneficiation field. Its treatment capacity is large, and the feeding size range is wide. It can discharge both up and down. As the professional manufacturer of JT4-2 jigger, JXSC Mine Machinery Factory will introduce the characteristics and its usage. JT4-2 jigger is first designed by the mineral institute to deal with iron ore. JXSC further improvement made it more adaptable and wider usage. 2) the design is much more reasonable and the failure maintenance rate is lower. 5) wider usage This new-type JT4-2 can be widely used for the beneficiation of hematite, limonite, specularite, manganese, mercury, antimony, fluorite, barite, celestite, pyrite and so on. 6) JT4-2 jigger can beneficiate ore below 30mm avoiding the classifying. 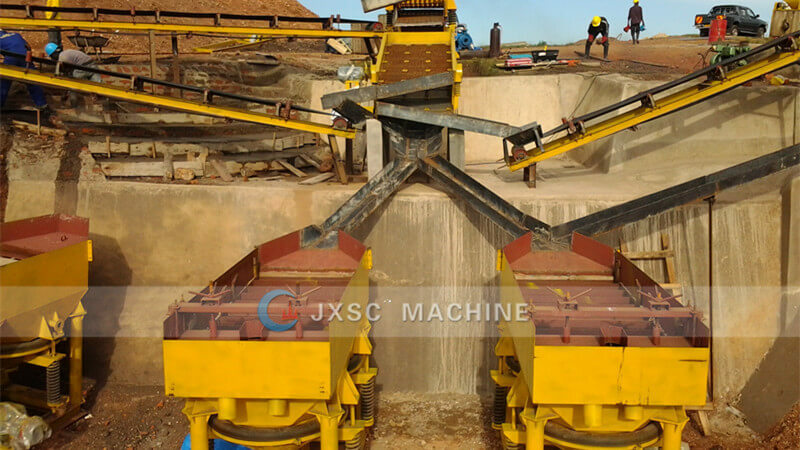 JXSC Mine Machinery Factory, a professional manufacturer of kinds of mining beneficiation equipment, has the impeccable trial platform which can do a free machine test. And we can design the flow sheet for your ore beneficiation. 9. Can achieve a good result in processing such as placer gold, tungsten, iron, tin, hematite, cope, tantalum-niobium, titanium, manganese, barite, zirconium, chrome and gemstone, etc. Below is our newly designed jig with more advanced function, the price is a bit higher than the ordinary jig separator. Its obvious advantage is quite suitable for recovery big grained concentrate, and the concentrate can discharge from both over-screen outlet; an under-screen outlet, please check the structure in the following picture. One of our Mongolian customers, his tin concentrate is in the range of 0-20mm, he applied our new-type jig separator for separation. the screen mesh size we set is 2mm, 2-20mm tin concentrate (37.65%) is discharged from the over-screen outlet, and 0-2mm tin concentrate (62.35%) is discharged from the under-screen outlet. By this separation method, the recovery ratio can reach more than 85%. 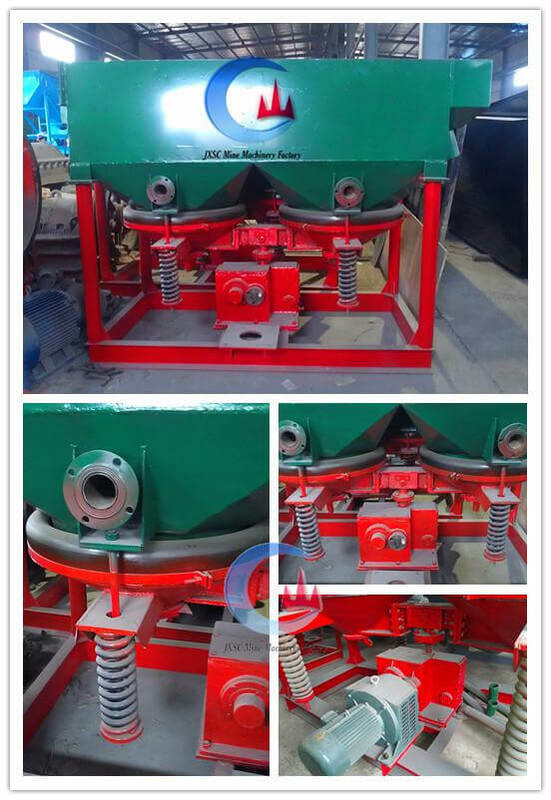 JXSC provides the full mineral jig solution for coltan/columbite/ tantalite/ Ta-Nb ore mining plant ( please give us the analysis report or send a sample to us, then we can design the processing flow chart for you.